OSWEGO, NY – This summer, Fort Ontario State Historic Site in Oswego, will host nine separate – (one week long) military history activity sessions for children ages 8-18. 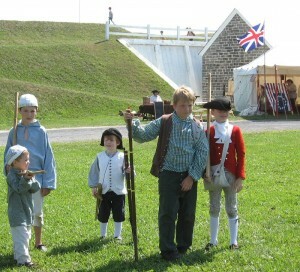 Historic games and activities will be featured at the summer kid’s history camp at Fort Ontario this summer. The sessions will be led by AmeriCorps staffer Ian Mumpton. The programming is aimed at getting young people outside and active during the summer. Kids will participate in historic sports, games, calisthenics, fatigue, marching, wooden musket drill, military crafts, flag signals, reading, singing, and other activities that promote physical activity and educate youths in Fort Ontario’s history. Monday – Friday weekly sessions for 8 – 12 year olds will run from June 27 – July 1, July 4 – 8, July 18 – 22, July 25 – 29, Aug. 8 – 12, and Aug. 15 – 1: sessions for 13 – 18 year olds will run from July 11 – 15, Aug. 1 – 5, and Aug. 22 – 26. All sessions will operate from 9 a.m. – 4 p.m. The programs are free, but space is limited and pre-registration is required. Participants must be in good physical condition and have a doctor’s note clearing them for physical activity. Youngsters can get a fun, active, history lesson at the fort this summer. Portable music devices are not allowed at the camp. For more information or to register, contact Mumpton at [email protected] or Fort Ontario at (315) 343-4711. The Kids Military History Camp at Fort Ontario is made possible by the support of the Friends of Fort Ontario, New York State Parks, and Oswego County AmeriCorps. The Oswego County AmeriCorps program focuses on services for children and families. This year, 57 members will serve at schools, libraries, recreation programs, and human service agencies throughout Oswego County.